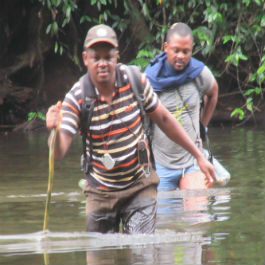 “Local people should be empowered to preserve the integrity of their natural heritage for their benefit and that of their children,” believes Orume Robinson, founder of Korup Rainforest Conservation Society (KRCS). 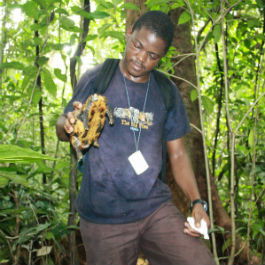 Established deep in the rainforests of south west Cameroon in 2009, the Born Free-supported KRCS empowers communities to protect the rich natural heritage of their local area. Locals are encouraged to share their traditional knowledge and expertise to promote co-existence between humans and wildlife. As founder, Orume’s dedication and motivation has helped KRCS achieve impressive results. In 2017, Born Free and KRCS worked together to set up an Elephant Guardian Programme in villages around Banyang-Mbo Wildlife Sanctuary. The project aims to create an environment where humans and elephants can co-exist together. Local communities are encouraged to inform project staff rather than elephant poachers when they encounter elephants, so that project staff can monitor the movements of the elephants. In return, the project is assisting village primary schools so that whole communities can benefit and, where elephant crop foraging is a problem, build chili-fencing as a conflict mitigation strategy for local farmers. Orume’s quiet persistence and unwavering determination to preserve and protect wildlife has helped him get even the most difficult of people on his side. 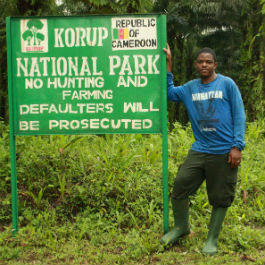 “We have also been able to resolve conflicts between hostile community youths and park rangers using football games so rangers could conduct law enforcement paths in otherwise abandoned areas,” Orume says. Actions speak louder than words – especially in conservation.